Life Hack Everyone, We've got a Life Hack here. The wall street fat-cats have your nuts in a vice? Are you tired of choking on a handful of filberts? 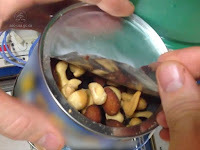 There is a simple way to make your own mixed nuts at only 5x the cost. That way is to buy the individual nuts you want and mix them yourself. BWAAM, Life Hack. No more picking almonds, or california commie pills as they are known in these parts, out of your nuts. You really can't put a price on getting enough pecans in your hand; other than $12 a pound, that's a price. Most lifehackers wildly exaggerate how inexpensive their idea is; here's a life hack for you: pallets cost money.